If you are a hunter, you are well aware that it can get dark extremely quick. This can be aggravating when you are on the tail of a nice game. However, there is only so much the human eye can do. With the fact that there are so many night-time outdoors enthusiasts and professionals in the world today, the growing need of night goggles have come to light. There are so many to choose from and finding cheap, quality night vision goggles can be difficult. So, here are 10 of the best night vision goggles in [year] that are recommended for any amateur, hobbyist, or a professional at the best prices possible. If you are a hunter, you may be interested in night vision scope aswell, we recently reviewed best night vision scopes aswell. Lets go through best Night Vision Goggles in detail. The Sightmark SM15070 is built with durable material. It is able to be mounted and used two ways. It can be mounted on the head piece given or it can be held in hand. It also has a tripod mount option. This enables you to be completely free while outdoors. It also contains an infrared illuminator that allows the ultimate night time experience. While it is built to be similar to the structure of “normal” binoculars, their inside specifications are amazing. You can expect to get seventy hours of battery life without the infrared illuminator and twenty hours with the infrared illuminator on a single charge or battery. It is also built with dual tubes that allow for the best quality in images. Its field of view ranges about thirty degrees and has a max distance of 100 meters. Whether you are a professional or an amateur, you cannot go wrong going with the Sightmark SM15070. Along with its great specifications and features it also includes an automatic bright light shut off. This means at any time that the lenses are faced with bright light, it automatically shuts off in order to protect the lens and infrared system. While the price tag may be a little more than expected, considering the quality of images and the durability, it’s worth the tag. It does range lower and fits into the list of cheap night vision goggles. The Tracker comes in with a near- infrared system and equipped with an LCD screen built inside the right eye-piece. It also comes with in infrared LED illuminator that goes up to 100 meters. This allows amazing night vision total for up to 100 meters. With a power conservative build, it is also given a rechargeable battery that can run continuous for up to one and a half hours. This gives the batter life of around six hours. The head mount allows the ability for the eye-pieces to fit around your eyes comfortably and contour your face. While being able to be approved for children, and able to be durable and comfortable, it also allows the ability to use function on an LCD screen right in your eyesight. This makes things much easier to keep track of and time correctly. This allows things to be completely hands-free. This is a great piece for search and rescue, night time paintball, or even hunting. Its easy setup allows for easiness of use. also build in monocular build. While it is only one eye, it allows the ability to use personal sight if you gain a situation where you cannot or do not want to use the goggle. While it is built with basic easy operations it does come with a twenty-five degree field of view. It also comes with an auto shut-off when exposed to bright light that could damage the infrared illuminator and lens. It takes 2AA batteries and can run up to 72 hours without use of the infrared illuminator. It can also hold up to 20 hours with the infrared illuminator in use. As mentioned prior, this Sightmark goggle is a monocular. While most are perceived with pirates, this one has its own world that it can rule. Such as it looks, its images are top quality. This Best night vision goggle is great for a hunter or fisher who needs to see precision up close. This allows the ability to use either type of sight to be able to achieve their goals and stay safe at the same time. It is also perfect for any amateur. Armasight built their Nyx7 goggles with the ability to be used in hand or head mounted. 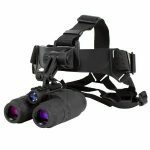 Its dual tube binoculars include an infrared illuminator. You can also attach other different types of illuminators as well. It also has a batter warning indicator in the eye piece and that allows you to keep updated on batter life. While it takes the look of a rugged military piece, it is waterproof. It also provides great quality images that are clear and bright. You can also purchase different lens to attach to the piece. It also has an auto bright shut-off that protects the pieces lens and illuminators. This piece is perfect from anyone who is an amateur, a hunter, or is professionally trained. It is easy to use but yet provides the best images. The Pulsar Edge comes with a dual tube structure and the ability to be hand held or head mounted. It includes an infrared illuminator and an ability to mount on a tripod. This allows for a full free range of abilities if done correctly. The micro channel tubes that are built into the binoculars are meant to last for a lifetime use. With the tubes built in, it also has an image intensifier tube. This allows the best quality of images possible. You can have a field of view for up to 100 yards. The infrared power is also adjustable as to give more ability to conserve energy to give more battery life. While the batteries are 2AAA, you can still get twenty hours of battery life with the infrared running. You will get up to around fifty hours without the infrared. With the way that this certain model was made, it was shown that it is easy to adjust even if you wear glasses. This allows even those who have to have special lenses to be able to put to use a night vision goggle. While there are many goggles out there, there are very few that are specified or built to accommodate with those who need to wear eye wear. This model definitely outsteps on that as there are so many that do wear glasses. The PVS-7 allows their goggle to be head or helmet mounted. It is built in with an image intensifier tube and also includes different sized brow pads. This allows comfortable wearing of the goggle while in use. It has a built in infrared illuminator and a flood lens. It also is built with a low batter indicator that comes on when your battery is low. In a complete total darkness the infrared system is still able to use. You can have a view of forty degrees and have amazing quality in the images. It is accepting with 2AA batteries and can have a batter life of up to 30 hours. The lens is also interchangeable so that you can set your own view. While it may seem like it is not much, it allows a lot of changing when concerning your images. It is protected by the United States and cannot be shipped outside of the US, but can be purchased withinthe USA. If at any time there is a need to transfer or sell, there will need to be proper permits documented for your own protection. This is perfect for learners, hunters, and professionals. Automatic shut offs allows better image quality and battery life and use. With all of the gadgets available and the indicators and added features, you can ensure you are getting a great quality product for the money you spend. This Tactical piece is able to be hand held, mounted on your helmet, or mounted on a head piece with ease. It is able to be lifted up out of view and holds secure even during movement. It also includes a demist shield. This allows clear images through the goggles, and keeps the shield from misting up in any way. It has an infrared illuminator that allows the ability to see your subject clearly and also a low battery indicator that lets you know when the battery is near dying. This piece includes and bright light auto shut off, which allows it to shut off if ever exposed to bright light that could damage the insides of the goggles. You can have up to forty degrees in your field of view. It runs on 2 AAA batteries and this also gives you about 30 hours of use off of those batteries. That is well more available to run through the night in whatever adventure you may be on. This piece is built with the ability to be military specification compliant. It obtains the basics that the military and other professionals use. This ensures quality in images and quality and durability in the piece. The Superior Tactical PVS-7 gives the basics but it also gives the quality needed in obtaining in the best quality of night vision available. It’s length of operation time is very beneficial as well. This gives you the time and resources needed for you to achieve what you are set out to do. The ATN comes in with being able to be hand held, head mounted, or helmet mounted. It also comes with an infrared illuminator and flood lens. It is the standard military issued night vision goggle. It also has a low batter indicator and other indicators that provide the ability to properly care and watch your piece. Coming in with a forty degree field of view, the ATN also has an auto bright control, which allows the ability for adjustment while changing environments and protecting your eyes and images. While it takes 2AA batteries, it allows you to get up to 30 hours of battery life. With all of its great features, it is still extremely easy to control its operations. They are easy to get to, and very easy to operate during any session or adventure that you may be on. This allows the ability for even an amateur to properly use and learn their night vision goggle and be safe while doing so. There is no fumbling around trying to find buttons and figure things out. While it is built standard with very little “extras”, there are many great parts to the ATN, as it does have added indicators that are not available on most. Considering the great quality and added indicators, it is a very good buy for the price. It is perfect for any amateur beginning with their experience with these best night vision goggles in [year]. While the Yukon NV is only meant for head mounting, it is equipped with an adjustable eye piece. This allows the piece to sit comfortably in front of your eyes and not give an annoying feel. The body is made with a rubberized material that allows for durability and protection of the night vision goggle. This also gives it a slick look. It also includes a flip up lens cover which allows protection of the lens. As you can see, it has great features already on it. It is also equipped with a pulse infrared illuminator which allows the piece to be energy efficient. Even with the use of the pulse infrared, you can get up to 40 hours of use time on its CR123A batteries. This is great security for an adventure taken overnight. While it is an energy saving durable piece, it also has pin holes in the lens cap so that you can use it during the day as well. This ability provides that while still protecting all of the tubes used for the imagery and lens. This allows for the ability to see images in the night vision goggles while the sun is up. Though it is not recommended to ever point the piece directly to the sun or other bright light, it does help on natural lighting situations. The Yukon NV gives perfect opportunity to be able to continue one for those who are avid on their game. This means, they don’t have to pack up everything at the time of sunrise, or they decide to go a bit early. This gives an individual more time to do what they love. The rubberized body also protects any bumping that may be involved in the adventures of which take place. The Firefield Tracker comes in with being able to be hand held or head mounted. It has a rubberized body which allows it to be durable and adds a sleek look to it as well. This also helps camouflage the user as well. While it is simple in features, it holds a bit of great things on its own. The Tracker includes a pulsing infrared illuminator of which allows great energy conservation. It takes CR123 batteries and gives you up to seventy hours of use without the use of the infrared illuminator and up to twenty hours with the illuminator. This gives a full nights use for the user. The Tracker has pin holes in the lens caps in order to be used even during the day. These are called eclipse pin holes. This allows the ability to use the piece even during the day and no damage is done to the lens or components. Where it is not recommended to point directly to the sun or any other bright light, it too can handle well in natural lighting. The Tracker is a great piece for the avid hunter or professional. However, this is also pretty easy to for an amateur to operate and learn even if they have never had experience before. It is very durable and can handle any light bumps that it may encounter during use. Each one of the listed best night vision goggles are expected to meet most or all needs that you may have. While there are some that require paperwork during purchase and transfer, as long as they are used properly, there will be no issues. It does work very much like a firearm that you may purchase or sell. All of the products listed have the ability to give great quality images and provide as much durability as possible. Most of them also have an infrared illuminator. This allows the ability to better see your subjects at night. The battery life last well through the night as well. So you do not have to worry about packing in early because of the lack of battery life. Decide what you want and need first, the environment of which you will be using them, and then decide accordingly. All these cheap and best night vision goggles are based on certain needs from the aspects of children, armatures, avid users, or professionals. All listed best night vision goggles are fairly simple to use and also have a pretty durable aspect of the way they were built. Remember, not all night vision goggles are the same. Do your research! While there may be some “cons” to a piece, remember that each one is built to suffice for certain needs. Checkout more Best night vision goggles [year] using below best sellers link.